All those who like the voice of the Albanain singer Ermal Meta, will be able to follow him closely in Tirana. After his first concert in Albania held on June 1, 2018 in "Skanderbeg Square", Ermal Meta returns to Tirana for an unforgettable evening. 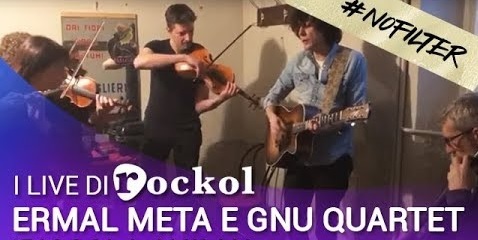 On March 4, the Albanian songwriter will perform in Tirana along with "GnuQuartet", a group of renowned instrumentalists, following the tour "Ermal Meta at the Theater with GnuQuartet". Tirana Mayor Erion Veliaj announced the news by posting on social networks as he invites the citizens not to lose his beautiful musical performance. Despite the international fame, Ermali never forgets the Albanian scene, where this time he will held a super performance in the Palace of Congresses. Along with four talented Italian artists of GnuQuartet, they will bring a magical atmosphere that should not be missed. When? On March 4, let's see the group there," Veliaj writes. This concert comes as a continuation of an unforgettable tour that Ermal Meta has realized during the Summer of 2018, with an impressive artistic performance. And soon, the Albanian songwriter launches a new tour, where he will also stop in Tirana, along with "GnuQuartet", to bring more new and unforgettable rhythms to Albanian public. The rhythm and musicality of these instrumentalists will make the music of the Albanian singer more lively. So there is nothing else but to enjoy their performance in Tirana. 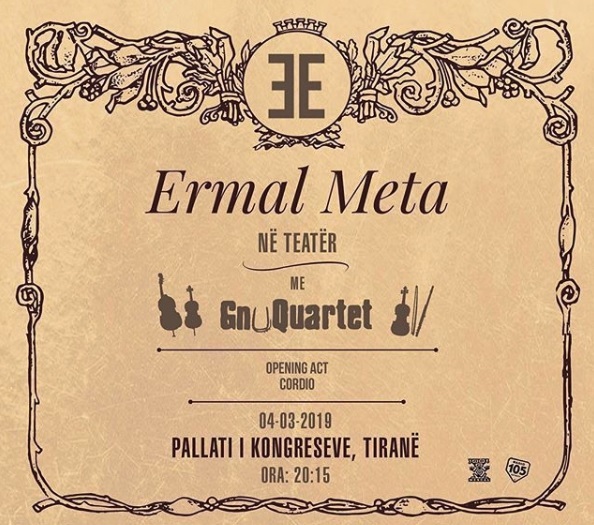 The calendar of the concerts within the tour "Ermal Meta in the Theater with GnuQuartet". February 4 - Naples - Theater "Bellini"
February 5 - Pescara - The Theater "Massimo"
February 11 - Catania - "Metropolitan Theater"
February 16 - Trento - Auditorium "Santa Chiara"
March 6 - Bari - The Theater "Petruzzelli"
March 9 - Assisi (PG) - "Lyrick Theater"
March 18 - Trieste - Theaters "Rossetti"
March 23 - Genoa - Theaters "Carlo Felice"
March 24 - Turin - Theaters "Colosseo".